Our family has an annual tradition of picking blueberries. We brave the hot sun with no shade relief to pick pounds of blueberries. We have blueberries coming out of our ears FOREVER. The weeks that follow have us eating blueberry pie, muffins, pancakes, smoothies, ice cream, and my favorite: blueberry jam. Canning has been on my bucket list forever! Three years ago, I finally faced my fear of killing off my family with botulism and canned my first batch of blueberry jam! Since then, I have branched out to tomatoes, salsa, and jalapenos. Although time consuming, this process has satisfied a deep longing in my soul to be able to provide nutritionally packed summer foods for my family in the middle of winter! 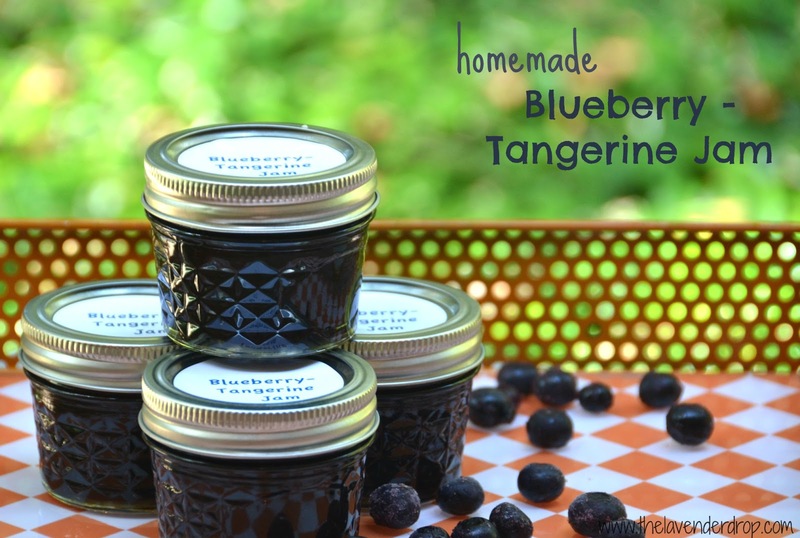 Here is my tried and true blueberry jam recipe. And because I love incorporating essential oils into almost everything now, this year I have added Tangerine Essential Oil for an out-of-this-world flavor combination. 1. Sanitize jars and lids. 2. Measure out 10 cups of raw blueberries. 3. Crush the berries to end up with 6/7 cups berries. 4. Measure out the sugar. 5. Mix the pectin with ¼ cup of the sugar. 6. Stir the pectin, water, and lemon juice into the blueberries and cook to a hard boil. 7. Add the sugar and cook at a hard boil for 1 minute. 9. Fill the jars to within ¼ inch from the top. 10. Wipe rims and put lids and rings on the jars. 11. Process in a boiling water bath for 5-10 minutes. If you are not wanting to dive into the full-blown canning experience yet, then this recipe can easily convert into a refrigerator jam. Simple complete steps 1-10, then store your jam in the refrigerator for about 1-2 months. *Only use therapeutic grade essential oils, which are safe to ingest. Most essential oils that you buy in stores are not pure and could do harm if ingested. Do your research as to which oils are safe. 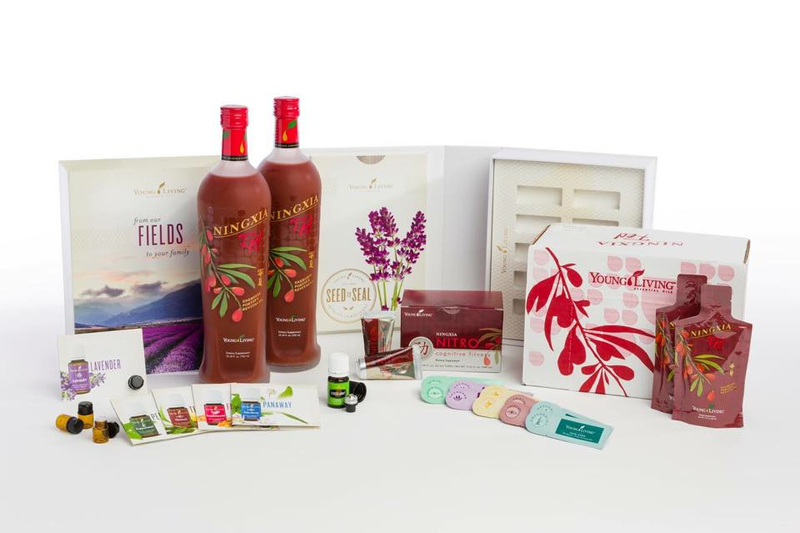 I have spent hours upon hours of looking into Young Living and I fully trust their process in extracting essential oils without harsh chemicals or high temperatures. Want to know where to get them? Follow this link HERE. Finally, this month, I'm participating in a blog circle with some amazing and beautiful women. Click on Joyfully Full of It and see what is happening with Tiffany this month. You can follow the links back around to me! We are on a full blown smoothie kick at our house. It is TOO HOT to warm up the oven or stove top. My people will take a smoothie any day for breakfast.. or snack time! This smoothie is so easy to make. 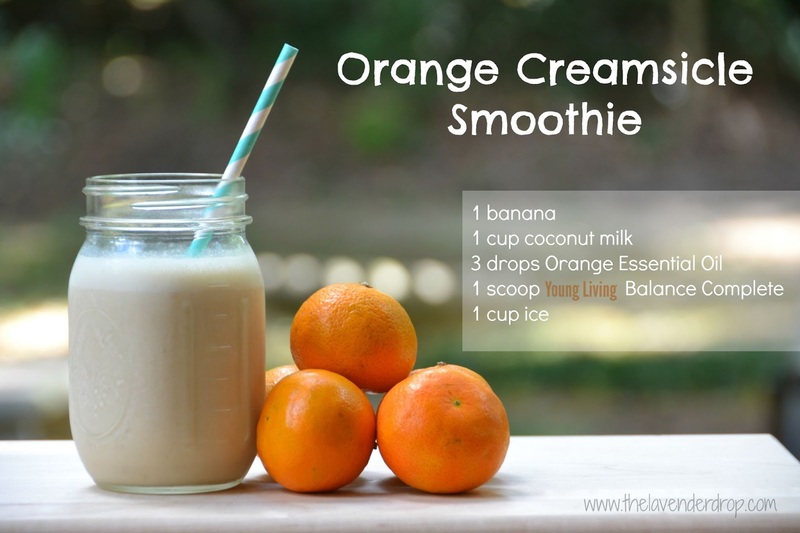 With just a few simple ingredients, you have a dairy-free, healthy treat. Enjoy! 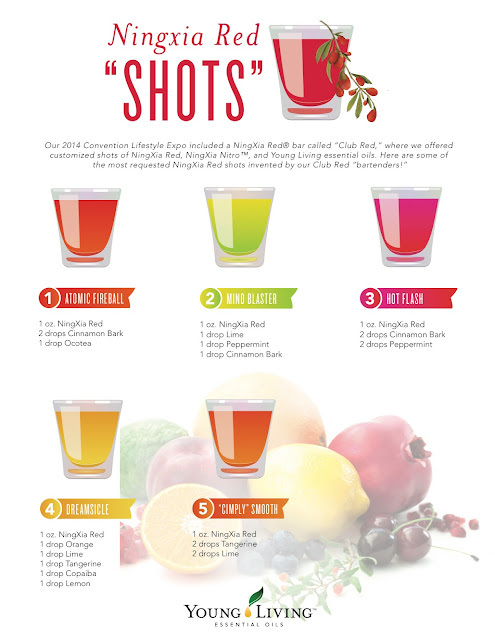 *Only use therapeutic grade essential oils, which are safe to ingest. 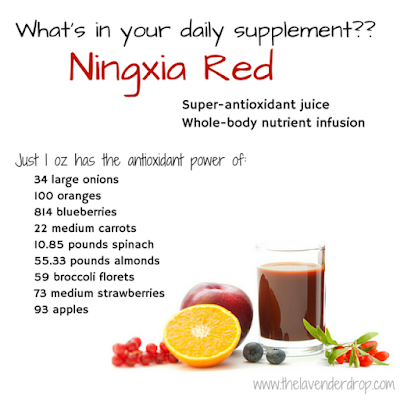 Need to know where to get them? Follow this link HERE. 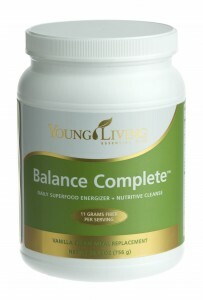 Balance Complete™ is a super-food-based meal replacement that is both a powerful nutritive energizer and a cleanser. 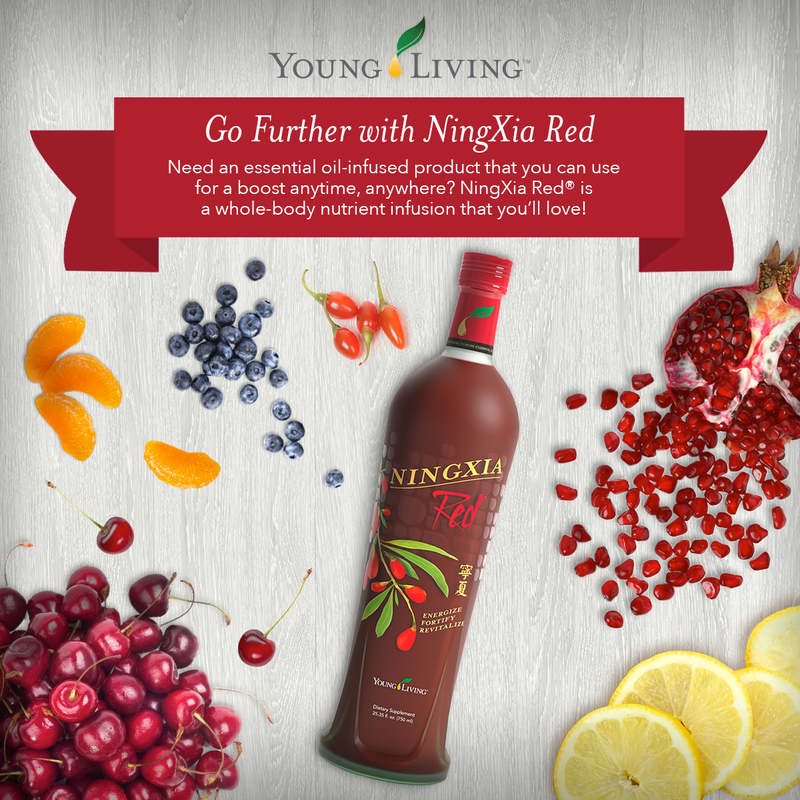 Offering the benefits of Ningxia wolfberry powder, brown rice bran, barley grass, extra virgin coconut oil, aloe vera, cinnamon powder, and our premium whey protein blend, Balance Complete is high in fiber, high in protein, and contains the good fats, enzymes, vitamins, and minerals needed for a nutritionally dynamic meal. Balance Complete also features Young Living's proprietary V-Fiber™ blend, which supplies an amazing 11 grams of fiber per serving, absorbs toxins, and satisfies the appetite while balancing the body's essential requirements.